Ashish Chugh is Investment analyst and founder of Hidden Gems Advisory. Ashish Chugh is a master in identifying Multibagger stocks. The entire stock portfolio of Ashish Chugh is full of multibagger stocks. He generated massive wealth from the stock market. The investment methodology of Ashish Chugh is unique. He invests potential multbagger stocks that are beaten badly because of short term negatives but carries inherent power to bounce back once negatives are over. The strategy adopted by Ashish Chugh paid off and he could able to generate a lot of money from stock market. In this post, we will take a look at secrets of identifying multibagger stocks by Ashish Chugh. Chugh looks at the “Big Picture” while investing in stock. He identifies stocks that are beaten due to negative news and reached to valuation that is at an acceptable level. If a stock has long term outlook he enters in the stock. Selling Pressure on Good Stockcoop good stock when everyone is selling. This is exactly opposite to what other investor does. Cash flow is next important point while making an investment. Majority of investor think only about returns while investing in stock. However, he looks at a number as he gives priority to risk management over historical returns. Future growth prospects is another important factor to consider while making an investment. If a company is on the expansion route or dealing with monopoly product chance of generating multibagger returns are higher. Management quality is utmost important in identifying good mutlibagger stock. One should look at honesty, integrity, dedication, and potential of management before investing in stock. We avoid stocks which are dumped during a bad quarterly performance. However, Ashish Chugh believes that knee-jerk reaction of an investor during the bad quarterly performance is time to enter in the stock for earning a bigger profit. Top multibagger stocks by Ashish Chugh are Natco, Bajaj Finserve, Greenply, Atul Auto, Avanti Feeds, Spicejet, Thirumalai chemicals, Vadilal Industries etc. 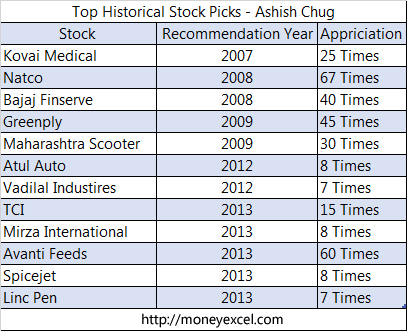 Top Historical Stock Pick by Chugh is given below. From above secrets of Chug, we can say that investing is a game of mind and not of emotion. Investor loses money as they are unable to control emotion and identify opportunities for investment. If investors follow the right methodology and gain control over emotion he/she can also become wealthy from the stock market.